EF Commander is a powerfull and multi-featured file manager witch a wide range of users, from beginners to professionals, will find easy to use. · Easy to use - The modern interface helps you to have full control over your files and folders. · Tabbed interface - Define just the views you need in each pane for your folders and files. · Thumbnails - Quickly and easily get an overview your photos or other image collections. · 32 bit multi-threading, parallel file operations - All long operations are run with multi-tasking. You can run any number of different operations at the same time, or several instances of the same operation -- for example, you can have several "copy" commands going simultaneously. · Direct link to PDAs with Windows CE - EF Commander was the first file manager wordwide with this feature. Handle your data in the same way as on your desktop or laptop computer. · Burn CDs and DVDs direct from EF Commander - Nero Burning ROM is required. · Internal packers for more than 20 archive formats - Use EF Commander to pack files or whole folders in any of the common archive formats. No external programs are required. · Internal viewer for more than 30 file formats - View picture files and movies, and play MP3 audio files, without having to use any other software. · Use XnView and IrfanView as add-ons - Enlarge the number of available formats to 400 or more. EF Commander runs quietly in the background, but remains fully available to you. Files can also be managed in the internal viewer, in the quick view mode, or as thumbnails. · Fast FTP-client - The built-in FTP client features resume download and FxP (server to server transfers). · Internal text and HEX editor - EF Commander has full text and hex editors for files that are limited only by your system resources. · Functions to split/join large files - Split large files into smaller parts, and recombine the parts. · Create/Verify checksums - Check the integrity of your data. EF Commandersupports the SFV, MD5 and SHA1 formats. · Synchronize function - Synchronize your notebook or your LAN with your work station. · External plug-in support for packers, viewers and file sytem - Extend the functionality of EF Commander with external plugins. Supported formats include WLX, WCX and WFX. 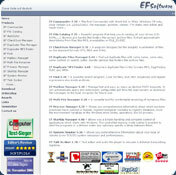 You cannot download any crack or serial number for EF Commander on this page. Every software that you are able to download on our site is legal. There is no crack, serial number, hack or activation key for EF Commander present here. Our collection also doesn't contain any keygens, because keygen programs are being used in illegal ways which we do not support. All software that you can find here is freely downloadable and legal. EF Commander installation package is prepared to be downloaded from our fast download servers. It is checked for possible viruses and is proven to be 100% clean and safe. Various leading antiviruses have been used to test EF Commander, if it contains any viruses. No infections have been found and downloading EF Commander is completelly problem free because of that reason. Our experts on malware detection tested EF Commander with various spyware and malware detection programs, including fyxm.net custom malware and spyware detection, and absolutelly no malware or spyware was found in EF Commander. All software that you can find on our servers, including EF Commander, is either freeware, shareware or open-source, some of the software packages are demo, trial or patch versions and if possible (public domain licence), we also host official full versions of software. Because we want to be one of the fastest download sites on the web, we host all the software including EF Commander on our servers. You cannot find here any torrents or download links that would lead you to dangerous sites.